Note: Wow a Draft post that never got posted! WHAT?!?! - This should have been posted back in November 2013. Oops! So I was called up into court to get the Queen’s permission to challenge into the Fian. Here is my written challenge to the Order. Lucas Cranach ArchiveI have long admire this style of dress, and it is such a complex garment, that I will really only able to do sections of it. What I love about this particular goldhaube and barett is that you can really see the blackwork embroidery, pearls and goldwork very well in this image. The barett is in such contrast to the very detailed goldhaube. I find hats very interesting and want to show off how amazing this hat/coif would be. These particular pieces were worn by ladies in the upper class located in southern Germany (Dresden area) from the 1520s to the 1540s). They were painted by many painters, but mostly by Lucas Cranach the Elder’s (and his workshop). 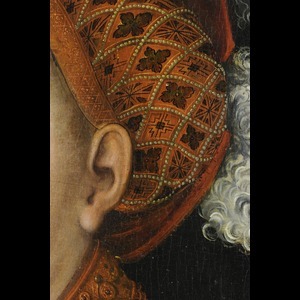 This particular piece has been dated to 1530 according to the portrait I am using. They often accompanied what we now call the German Saxon dress, as it was worn often by ladies from the Saxony area of Germany. Each painting has a different style or look to the goldhaube, so you can tell that it is a personal choice in how they were decorated. I am particularly interested in how such heavy beading can stay on the head (without any visible attachment). It is also noted in my research that women in Germany at the time often had false braids purchased or made for them so that they could get the correct shape to their goldhaubes. I will also be creating any necessary accessories to get the correct look. This project is a stretch of me because I have not done blackwork embroidery or heavy beading before. I have completed hats by hand, but this detail will be new to me. I will be learning how to do detailed work and learning how to embroider/bead. I will also need to learn how blackwork patterns were created, to recreate this goldhaube perfectly. The risk of this is that I have never done blackwork before. I have done counted cross stich in the past, but this will be new for me. So I will need to take a lot of time just to perfect the pattern and my technique before I even get to put needle to expensive fabric. It will also be a true test of working on an item throughout the year and not try and finish in a weekend. I have created elaborate hats in the past (beaded gable hood), embroidery and silk ribbon embroidery. I understand the requirements for this accessory. 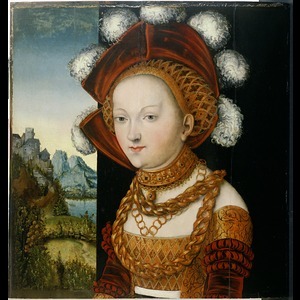 I have been researching this whole garment for three years, I have studied many painting and images (I did a trip to Germany so I could see as many Cranach paintings I could) with the goal of doing this for my challenge. What has changed is that I am not doing the whole garment, but just taking smaller more detailed pieces to work on. I hope to learn proper blackwork technique, how to bead on fabric and improve my hand sewing techniques. I will also hope to improve on my research skills and time management skills. I want to make this as perfect as I can. I will be using hand sewing as my main method. For the goldhaube I would like to use a silk taffeta as the outer fabric, with a linen lining. It is possible that it may require an interlining as well, depending on the weight of the beading. I will be using black and gold silk threads for the embroidery and freshwater pearls for the beading. The beads will be strung and couched down on the fabric. For the barett, I am still deciding between wool or silk velvet for it and I need to complete my research on what feathers I will be using. I will most likely not be creating my own patterns, as there are many available at this time, which will help me concentrate on the embroidery. I enjoy learning new techniques to better my clothing making, and I have wanted to make this for a very long time. I have made hats in the past, so the sewing is not new for me, but the beading and embroidery will be. I have been making garb and accessories for well over 15 years now, so my challenge is to recreate something and have it be very detailed. I expect that this project will take me the full year to embroider, bead and create by hand. I have looked at what I need to do and barring any unforeseen problems this should be completed in time. Once I have completed my samples I will have a better idea on the time it will take to do the embroidery. I anticipate at least 100 hours (including sampling) to complete. 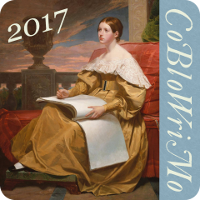 I will also be keeping a detailed diary on my blog of my progress. I feel that I don’t need to expand this challenge as I have actually taken my original challenge (to create by hand a whole German Saxon gown including all accessories) and focused it more, as it was too broad and I would not be able to complete in the allotted time. After many discussions with friends, I determined it was better for me to concentrate on the items I really loved and complete them to the best of my ability. There are still some unknown or items that need more fine tuning, but most of that will happen as I finish my research. 1. Start collecting fabric, findings and pearls. – hope to do this black Friday. 2. Draw out and figure out the blackwork/goldwork designs on paper. 3. Start a sampler for the blackout and gold work designs. 4. Test out many types of thread (linen, silk) while working the sampler. Also this time will be used to gauge how long it will take to complete the embroidery. I anticipate that this will take me right through to January if not February. I want to have it so that I am doing at least 4 hours a week on it.